This is the only book I have ever seen that feature someone with Down Syndrome as the main character where the story is not about their special needs. The only way a reader can tell that Cindy has Down Syndrome is from the illustrations, and a few contextual clues. 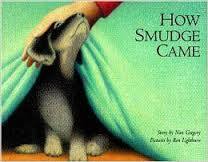 The story itself is about friendship, and a cute little puppy that appears as a smudge in the dark. The story is beautifully told, using as few words as possible to get the poignant message across (the sign of a truly great author). I also loved the colored pencil illustrations in this book. They are very soft, as if viewing the story through a filter, and very appropriate to the overall feel of the book. This is a great book to use when discussing feelings and recognizing how others may feel, or it may spark a discussion of friendship. This book is a must for any preschool library, especially if there is a child with Down Syndrome enrolled. Every child should be able to have a book where they see himself/herself as the hero!